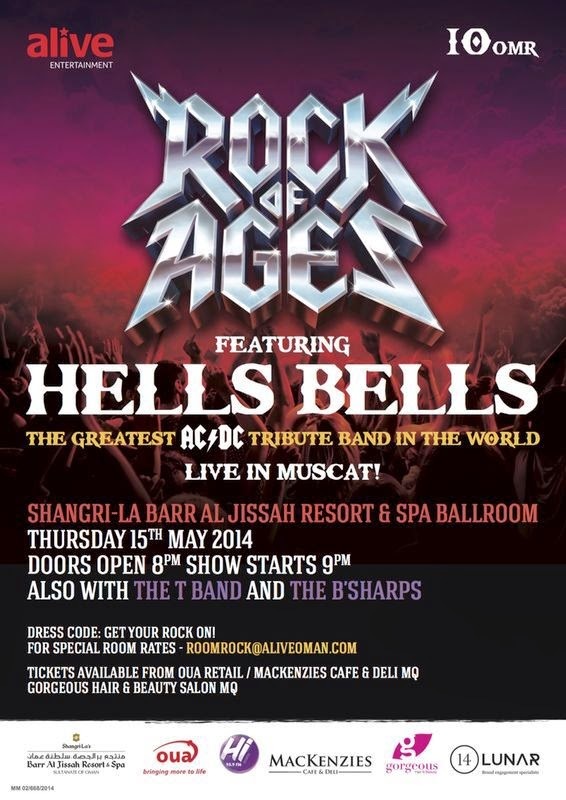 Alive Events have one final gig before the summer shutdown, this one being the Rock of Ages rock night, this year being held at the Shangri-la's ballroom on the 15th of May from 8pm. The event basically has 3 bands, the headliner is Hells Bells, an AC/DC tribute band from the UK, and then the very good local bands T Band and B Sharps (who both played the recent Canadian Stampede party). Tickets are a tenner (RO 10), with Rockin Room rates available (email: roomrock@aliveoman.com to learn more about the Rockin Room rates) and to reserve a ticket email tickets@aliveoman.com. The tickets will be on sale from 2pm on Sunday 11th of May at MacKenzies Cafe & Deli, OUA Retail MQ and for ladies only, Gorgeous Hair & Beauty Salon MQ (Rock Chic Hair Styles will be on offer at the Salon as well).